*(The author thanks Vitor Ido for his extensive notes of the 1st round of informal consultations held on 20 June 2018). 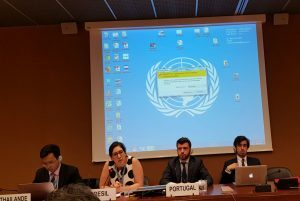 On Thursday, 28 June 2018, the delegations of Brazil, Colombia, Mozambique, Portugal, and Thailand submitted a draft resolution on “Human rights in the context of HIV and AIDS” to the 38th session of the Human Rights Council. The text of the final resolution can be found here. Incidentally, the United States of America withdrew from the Human Rights Council on 19 June 2018. The Core Group held a series of three informals (20 June 2018, 22 June 2018, and 26 June 2018) to read through the text. In the operative section, the Core Group proposed the following language which underscored the principle of non-discrimination with respect to access to “safe, effective and affordable medicines, diagnosis and treatment for all”. 25. Further requests the High Commissioner to prepare a report on the outcome of the consultation, to be presented to the Human Rights Council at its forty-first session, in which he identifies regional and subregional strategies and best practices to respond to the HIV epidemic and to respect, protect and fulfil the rights of people living with, presumed to be living with, at risk of, or affected by HIV. The first round of informals took place on Wednesday, 20 June 2018. Italy, Brazil, Mexico, Peru, Egypt, Australia, Germany, Ireland, Switzerland, Slovenia, Botswana, Sweden, Denmark, Finland, United Kingdom, New Zealand, Uruguay, Argentina, Russian Federation, Indonesia, France, South Africa, Singapore, Venezuela, Norway, and Spain took the floor during the meeting. At the informal, Switzerland proposed the language of WHA70.12 (Cancer prevention and control in the context of an integrated approach) as an alternative to language proposed by the Core Group which acknowledged the the concerns about the effects of intellectual property protection on the prices of medicines. During the first round of informal negotiations, Switzerland stressed that it “would be more comfortable if we could stick to agreed language of WHA in this context”, saying that the language proposed by the Core Group did “not reflect the comprehensive approach of our national policies.” During the informals, Egypt expressed its support for the text as drafted, and Spain expressed its support for the Core Group’s original language noting that Spain was “really interested in defending the human rights of people affected by HIV/AIDS, and to make treatment available. Therefore, this kind of language is important, so we would like to stick to it.” As it stands, the Core Group’s original text stands. (Source: Vitor Ito’s notes of the First Round of Informals, 20 June 2018).